I call this dish "Super" one-pot donabe dish, because it's basically you assemble all the main ingredients in a donabe and just cook them together all at once. You cook and serve in one pot and it tastes really great. I love the combination of the spiciness and a slight tangy kick from the black vinegar. 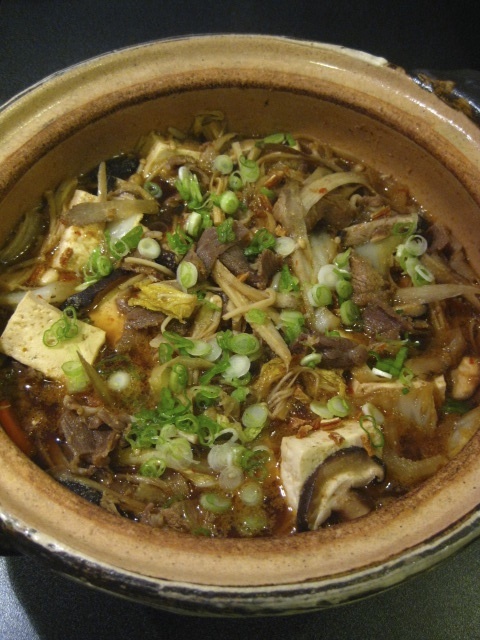 You can adjust the amount of doubanjiang according to your taste. With pork and different kinds of vegetables, it's also nutritiously-balanced. 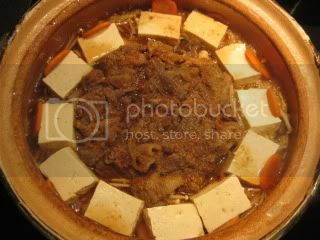 Serve with freshly-made donabe rice, then it makes a tasty meal. For this dish, I used my beautiful classic-style donabe, "Hakeme" (medium-size). 1. In a bowl, whisk together the ingredients for the marinade until smooth. Add the pork and mix well by hand. Cover and refrigerate for 30 minutes. 2. 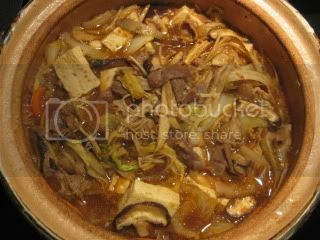 In donabe, spread the napa cabbage evenly on the bottom. 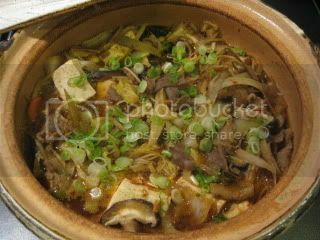 Add the burdock root, shiitake mushrooms, and enoki mushrooms in layers. 3. 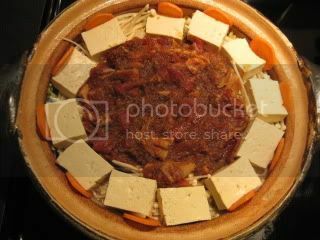 Add the tofu pieces and arrange them to make a circle along the rim. Arrange the carrot slices next to tofu pieces. Add the chicken stock. 4. Lay the pork with the marinade in the center and press gently to make a even layer. 5. 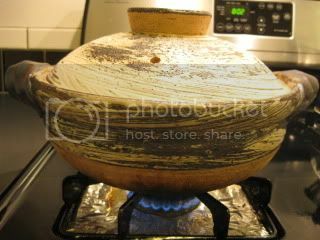 Cover and set donabe over medium heat. Let it cook for 8-10 minutes or until the broth starts simmering and the pork starts to cook. Stir. 6. Cover again and cook for additional 3-4 minutes or until everything is cooked through. Add the black vinegar and stir again. Remove from the heat. 7. Garnish with more sesame seeds (optional) and sliced scallions. Serve immediately.